I can remember as child looking forward to our neighbor's bleeding hearts blooming. It was a little miracle to me that a plant could actually flower hearts. In fact, I still think it is miracle. 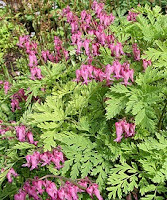 There are many different varieties of Dicentra. 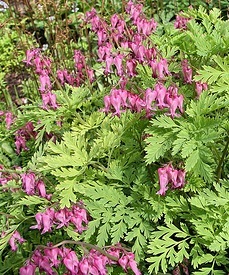 The old fashioned bleeding heart (dicentra spectabilis) blooms in spring, and then depending on the light and water in your yard can die off in July to return the following spring. I have never had mine die off, and it's even on a pretty sunny corner. However, the one I had in my previous yard would die off in mid-summer. The fringed bleeding heart blooms intermittently from spring through fall. Whereas the old fashioned format is tall (12-30"), the fringed bleeding heart grows to only 12-18" with light feathery foliage.